The first two American-made Voith Schneider Propeller (VSP) units have been delivered and installed in the Rodanthe ferry. Rodanthe is a ferry to be operated by the North Carolina Department of Transportation (NCDOT) and used in its service to the Outer Banks, a string of barrier islands between North Carolina and the Atlantic Ocean. “With the new VSP units installed, the Rodanthe will offer years of smooth, efficient service to the islands. By linking steering and propulsion together, the VSP allows for fast response and precision movement in even the roughest of waters. This helps the operators pilot their ferry better while also keeping passengers and cargo safe thanks to the VSP’s superior handling in comparison to other propulsion systems available on the market,” explained Ivo Beu, Head of Marine Business Americas for Voith. To serve the popular tourist area, the ferry will be added to the fleet that transports 1,623,670 passengers and 751,656 vehicles per year between the islands of Ocracoke and Hatteras. These trips, made several times daily all year long, include careful maneuvering and docking procedures that are managed with the VSP’s unified steering- and propulsion-control system. Further, unlike normal propeller systems, the VSP is noted for its operational reliability and low maintenance requirements. 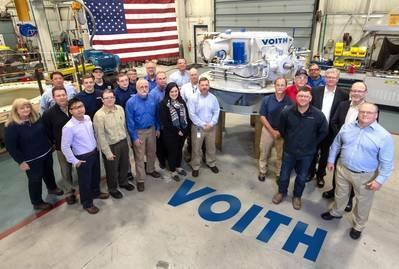 Commissioned by NCDOT, the VSP propulsion systems were built and tested in Voith’s York, Pennsylvania, facility to meet the unique specifications required for the island-hopping ferries. Likewise, their Pennsylvania assembly allows NCDOT to champion its use of an American workforce on the project. After assembly of the VSP units was complete in November 2018, the propellers were delivered to Bollinger Shipyards in Louisiana for installation into the Rodanthe. In May 2019, the ferry will be delivered to the NCDOT Shipyard in Manns Harbor, North Carolina, and it is expected to go into service in the summer of 2019 on the Outer Banks.